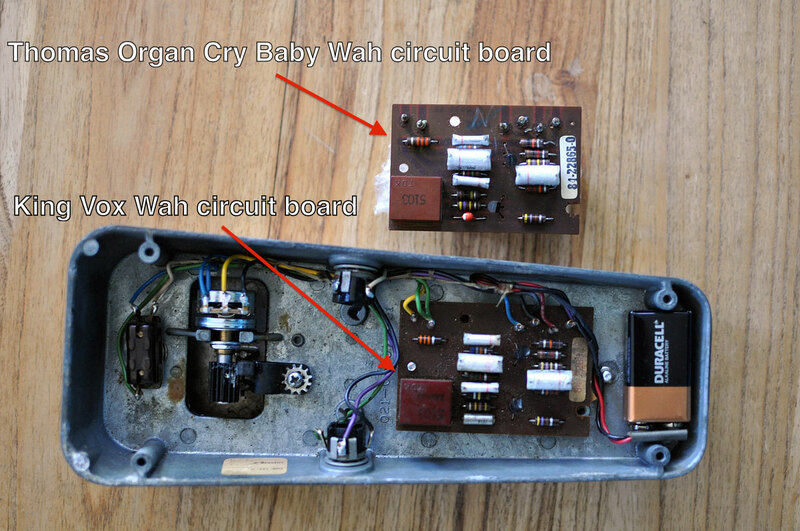 The King Vox Wah and the Cry Baby from the 1970s were both made by the Thomas Organ Company. Both used the standard wah circuit that most manufacturers still use to this day. They were made on the same circuit board, 5117 transistors with a TDK 5103 inductor, used the same component values, and should sound identical. The only difference is that this King Vox Wah has an electrolytic capacitor where the Cry Baby has a tantalum of the same value. This is due to the fact that the circuit boards were manufactured a few years apart and would not change the tone in any way for this application. This entry was posted in Modifications. Bookmark the permalink.